Slant-D Reference Binder features no-pinch rings open and close. Lock with just one touch. Binder holds 25 percent more than standard round-ring binders. Inserts will not stick to the polypropylene cover. 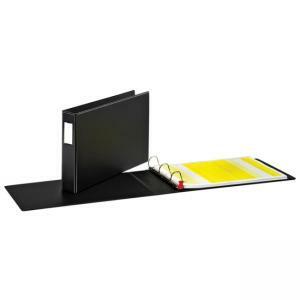 Binder offers horizontal pockets inside front and back and flat poly sheet lifters. Clear overlays hold custom title sheets. Durable heavy-gauge vinyl cover protects contents. Binder offers 65 percent recycled content by material weight and earned Ease-Of-Use Commendation from the Arthritis Foundation.